Is "Humane Certified" Really Humane? The public is getting more and more enraged by clear violations of humane treatment and reasonable animal welfare for farm animals, including chickens. This time it was Foster Farms, a member of the US Chicken Mafia. The Chicken Mafia can and should be preventing these incidents from occurring, then promptly responding to these incidents when their prevention efforts were insufficient. Instead, the Chicken Mafia, whether in the US or Canada, prefer to delay, deny, distract, defend, destroy, deride, and deflect; rather than make the necessary changes to their dysfunctional systems. Mercy for Animals enlisted Bob Barker, the former "Price Is Right" host, TV personality, and animal rights advocate for more than 30 years, to host and narrate this shocking video. If the above video is reliable evidence, something in this commercial chicken system is broken, and needs to be fixed. The above video is alleged to have been shot in California USA, at Foster Farms poultry slaughterhouse in Fresno, and their three poultry farms in Fresno County. Once the undercover video was published, Foster Farms suspended 5 employees, and are doing re-training for the other employees in the areas investigated. The allegations received an immediate knee jerk reaction by the management of Foster Farms, blaming their employees. Foster Farms response to the video is here. Foster Farms says that every employee has animal welfare training every year. If that's true, how do we explain the actions shown in the video? Does management give mere lip service in this training (ie. rolling their eyes, cracking jokes, turning it into a farce)? On the other hand, is every employee required to do a comprehensive comprehension test at the end of the training, to prove that they were paying attention, and fully understood? Using dummy chickens, can each employee demonstrate what they understand to be acceptable animal treatment at their work station, and what is unacceptable (and might lead to them being fired)? In spite of Foster Farms putting 100% of the blame onto the employees in their press release, does the management of Foster Farms have any blood on their hands? Provide each employee with all the necessary resources to readily achieve what is expected (eg. money, training, equipment, data, feedback, recognition, dignity, respect, supervision, tools, etc.). Ensure each employee can (and does) measure and understand the difference between what is expected and what actually occurred. Ensure that all employees take prompt corrective action to close the gap(s) between what is expected & what actually occurred. Ensure that risks and non-conformances are promptly identified, and actions are taken to prevent their occurrence (or re-occurrence). To run an organization without these 5 managerial duties, is to abdicate management's responsibilities. For example, if the driver of a vehicle suddenly decided to close their eyes and let go of the steering wheel of their moving vehicle while driving on a busy street, should society hold that driver responsible for the subsequent carnage? Without these 5 duties, the management has similarly let go of the corporate steering wheel and closed their eyes, and subjected all those nearby to the gruesome consequences. Did the management of Foster Farms do any of those 5 steps? If they didn't do all 5 steps in a comprehensive and effective manner, then the blame for the animal abuse sits on the shoulders of both Foster's management and the employees who actually did the abuse. One news report on this scandal raised the issue of the poor working conditions suffered by the employees working at Foster Farms. If the employees feel abused in their jobs at the hands of Foster management, some employees may lash out at the animals they are forced to process at break neck speeds. As a hands-on employee on the chicken processing line, how do you keep your empathy and sanity in spite of the thousands of animals you send to their death every day, and avoid becoming desensitized to the animals' welfare? In the video, Bob Barker (and/or Mercy of Animals) also blame the American Humane Association ("AHA") for enabling this abuse by falsely certifying Foster Farms and their chicken processes as "humane". The Chicken Mafia is rich. Foster Farms is one of the biggest chicken producers in the US, with 10,000-employees, operations in California, Oregon, Washington, Colorado, Arkansas and Alabama, a comprehensive line of products that's sold globally, with over 100 producers on more than 7,000 farms. Foster Farms says they employ two full-time avian veterinarians and a poultry nutritionist. Where were these professionals when these abuses were ongoing? Did these professionals know about, suspect, or turned a blind eye to this abuse? I believe any corporation that big should have known better, and taken better care to prevent these issues from occurring. "Since 1877 the historic American Humane Association has been at the forefront of every major advance in protecting children, pets and farm animals from abuse and neglect." AHA doesn't own nor operate any animal welfare shelters. AHA has drafted a document of best practices and minimal accepted standards to which about 300 animal shelters have voluntarily endorsed, follow, and pay AHA to audit their compliance. AHA also has the exclusive contract to ensure that animals are well treated in all Hollywood movies and similar artistic productions. There are others who also certify animal welfare excellence. For example, Animal Welfare Institute (AWI), this label has the most stringent guidelines. It is only issued to meat that comes from independent family farms. Humane Farm Animal Care has Certified Humane, which USA Today called the "Gold Standard" for animal welfare. According to Charity Navigation, AHA has recently suffered a 16.3% drop in funding to its charitable programs for animal welfare. PetSmart Charities (a recent spin off of the US for-profit pet store chain that has a similar purpose to AHA) has a 22.9% better charity effectiveness score that AHA, and a $51 Million per year budget; almost 4 times bigger than AHA. Obviously, older isn't necessarily better. Does this loss of market share and exclusivity explain why AHA supported Foster Farms and the Chicken Mafia in their time of need, so as to obtain some quick cash for the AHA? To become AHA certified for animal welfare, AHA requires an application, payment of a fee to AHA, an on-site audit by a certified ISO auditor who also has animal species-specific expertise, a review and approval of the audit results, employee training, and annual re-certification. Sounds pretty good to me. But is it effective, or a smoke screen? The AHA standard for broiler chickens is 136 pages in length. I haven't read the entire document, but I skimmed through it, as well as fully read and analyzed a few key sections. There are a few typos, a few unclear sentences here and there, but for the most part, it seems to be a good standard to help ensure animal welfare. Red Rover says that AHA's certification system is not as thorough as the other two major animal welfare certification bodies. Is that why Foster Farms chose AHA's system? Perhaps Foster Farms couldn't be bothered, or couldn't achieve compliance to the higher standards? Whatever the answer, it seems to me that if a farm or chicken processing plant was fully compliant to the spirit and letter of AHA's standard, most people would find it acceptable. The Mercy for Animals video shown above is clearly in violation of all three standards for animal welfare. Therefore we are left to question the AHA auditors that were sent to Foster Farms, the auditing process, and compliance by Foster Farms' employees to the defined animal welfare standard. During AHA's audits, do the auditors seek objective evidence that Foster Farms' management has consistently and effectively implemented all 5 steps listed above? Paper documents, by themselves, don't keep animals safe and well cared for. Many ISO-based quality management systems are bureaucratic, bloated, and ineffective; in spite of gold stars on their audit reports. I know, as I spent 27 years as a certified ISO auditor. Management must be engaged, and vigilant to ensure they build a culture that believes, supports, and practices the applicable standards every hour of every day. Does Foster meet that criteria? If they did, they would have been aware (or suspected) the potential for abuse portrayed in the video, and stopped it from occurring (or re-occurring) long before the Mercy for Animals undercover operative arrived with their video camera. It takes time, skill, and significant effort to do a comprehensive audit, looking for evidence of what occurs when the auditor is there, as well as what happens between audits. Are the auditors given sufficient time? Are auditors encouraged and supported to dig deep and have the confidence to report fully and honestly, in spite of cajoling and attempts at manipulation of audit results by the employees and management? Are verification and validation audits done by outside auditors (separate from both the company being audited, and AHA as well)? This could be used to see if AHA auditors are doing full and comprehensive audits with consistent and repeatable results. Hopefully, in time, we we learn the full details, and will be reassured how both Foster and the AHA certification process will both be improved. Could we expect the same or similar results if Mercy for Animals did more undercover work in a factory farm and/or processing plant inside Canada? Unfortunately, based on my research on the Chicken Mafia in Canada, I'm sad to say it's likely as bad or worse in Canada as what Foster Farms got caught doing in the USA. What are the opinions of CFC, CFO, and all the other provincial Chicken Boards about the incidents described in the video? It is a long standing legal precedent that silence should be interpreted as acceptance. Who will ask each and every one of these Canadian Chicken Boards, as well as the provincial and Federal supervising commissions what they have done (or will start doing) so that similar animal abuse in Canada's system will be prevented, and/or detected and remedial actions taken to prevent re-occurrence? Today, I sent a link to this posting for both Foster Farms and the AHA, requesting their comments. If I receive anything (which I doubt), I will post it so the world can clearly know their positions on the issues raised in this Blog posting. Small Flock Poultry Farmers of Canada ("SFPFC") has clearly defined its expectations for animal welfare. See Clauses 2 and 3 of SFPFC's Principles. Why hasn't the Chicken Mafia been able to do similarly? 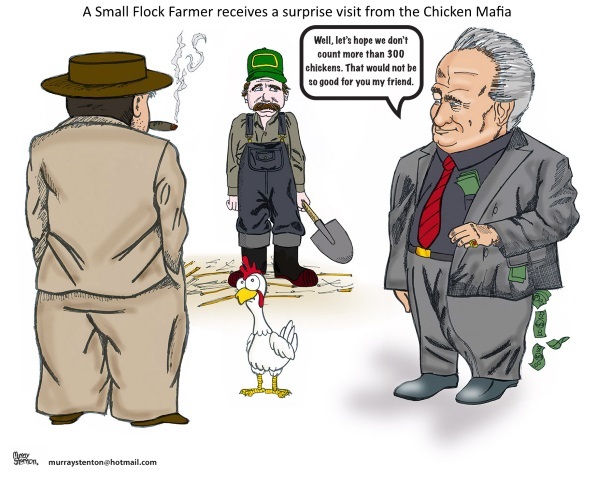 Unfortunately, the Chicken Mafia gives all chicken farmers and chicken processors a bad name, even Small Flockers. The Chicken Mafia has all the illicit power, all the improper rights, and the devious support of all levels of government. The Chicken Mafia uses those powers to oppress Small Flock Farmers, and hurt all Canadian consumers. For some strange reason, there is a conspiracy of silence throughout Canada on these illicit powers and their improper use. Frederick Douglass (1818 - 1895), African-American social reformer, abolitionist orator, writer, and statesman, from his speech “West India Emancipation” at Canandaigua, New York, on August 3, 1857; the twenty-third anniversary of the event. We will never solve this injustice by patiently awaiting the self-realization of the Chicken Mafia as to the error of their ways. For example, small flock poultry farmers in Ontario are restricted to growing just 300 chickens per year for meat; enough to feed chicken to 7 people for a year. A tip of the hat to Murray Stenton, a graphic designer/cartoonist from Halifax Nova Scotia. Well done cartoon. Thanks! CFIA is investigating allegations that lower quality chicken was being fraudulently packaged and labeled as antibiotic free, animal by-products free ("AABF"), organic chicken by Cericola Farms Inc. The story details can be read here and here. While Vashti Dalipsingh was the Director of Operations at Cericola Farms Inc., during more than five month period she alleges that she was repeatedly ordered to package normal broiler chickens as the premium grade antibiotic free, animal by-products free ("AABF") organic chicken; usually when they ran out of organic chicken. Dalipsingh says she dug into Cericola's records and realized the fraudulent practice had been going on for eight months before she was fired in April (placing the start date at Sept 2014). She claims that up to 10,000 kg./wk. of conventional meat was intentionally labelled organic to keep up with demand by Cericola's customers. Running out of organic chicken prior to filling the entire quantity ordered by national chain customers (eg. Loblaws, Sobeys, Costco, etc.) is a dangerous occurrence that is not tolerated by these huge customers. Cericola claims to be the 2nd largest supplier or organic chicken, and to have been supplying "organic" chicken for 56 years (ie. since 1959). The world's first recorded use of "organic" in the sense of "free from pesticides and fertilizers" was attested in 1942; 17 years before Cericola's first use. The products, which include Blue Goose Organic and Blue Goose AABF, ended up on shelves at Sobeys, Loblaws and Costco in Greater Toronto and in the Moncton, N.B. area, Dalipsingh’s legal team said. Of course, Cericola Farms insists that all is well, their chicken is fantastic, and there is no basis for the allegations made against them. Did you expect them to say anything different? Cericola Farms said Dalipsingh's allegations "are frivolous and vexatious, and we intend to vigorously defend our company in court". Blue Goose, one of the organic chicken brands wounded by these allegations against Cericola has said that they are standing by Cericola, as is Loblaws. Loblaws was also reported to have said they would "act quickly" if the allegations are proven. On Monday June 15th 2015 I spoke to the Store Manager of a Loblaws who told me that he had received a recall notice from his head office for a number of SKU's of Blue Goose, but he had none of the recalled SKU's on the store shelves. If CFIA does their job, they can readily find other employees who witnessed or participated in the fraud, if it occurred. Whether these other witnesses come forward will likely depend on how much fear Cericola is able to raise in the employee's minds. If people think that whistleblowing will cost them their job, or perhaps everybody's job if the plant is caused to be shut down, they will likely keep quiet. Forensic auditing can easily determine if more organic chicken was shipped out of Cericola's plant than what was grown. Farms are required to keep records for at least 12 months to 7 years, depending on the type of record. Inventory records are kept on the stock of organic chicken in the process and the storage coolers. In a day to a week of detective work, the truth can be outed. How hard will CFIA investigate? CFIA: "Did you do that alleged organic chicken fraud?". CFIA: "That's good enough for me. Sorry to bother you. This case is closed." CFIA wraps up another investigation in record time. While CFIA may not be effective, they certainly are quick to start, and quick to finish. In time, we will see what CFIA actually decides to do. The other possibility is the unjust dismissal lawsuit. While civil suits require full disclosure of info by each party, I'm not so naive to think this always happens as it should. If it's like the Egg Mafia who were caught shipping known defective eggs by CFIA, there will be a giant purge of computer records, and mountains of shredded papers. Of course, that wasn't criminal conspiracy to hamper a police investigation, it was just Spring Cleaning. Canada's Supply Management System for chicken ensures that these multi-millionaire chicken farmers are the highest paid farmers in Canada, according to Stats Canada. Just how much further along this terrible path will we be forced to march? Bird Flu is expensive. Who gets stuck with the bill for all of that biosecurity misfortune (or negligence)? I previously outlined the significant questions that exist on Bird Flu and the Chicken Mafia's response. Consumers eventually, and ultimately, get stuck with the bill for the negligence of chicken factory farmers. How much will it cost consumers? "United States Agriculture Secretary Tom Vilsack said this week that the virus is going to cost the federal treasury $410 and said the costs could mount to $500 million." Half a Billion dollars isn't a bad start. Of course, that's just the government's share for the condemned birds ordered to be destroyed. The total cost is much larger. There are costs to dispose of the dead carcasses, to clean the barns and sanitize them, the losses from business interruption. "The U.S. price for eggs for processing has risen from 65 cents to $2.35 a dozen in the last five weeks." That's a 361% price increase. Ouch! Let's assume that the total cost in the US will be $1 Billion. Since they are 16 times bigger than the Canadian system, the cost for Canada is roughly $62.5 Million for 2015. So how do Canadian consumers get stuck with the bill? First of all, where does the government get their money to pay compensation for biosecurity negligence by SM farmers? Of course, all of it comes from taxes paid by taxpayers. Next, the Chicken Mafia has covered their bets by forming Poultry Insurance Exchange Reciprocal of Canada ("PIERC") in 2008 or there abouts. This is a reciprocal insurance company that provides insurance benefits to the Chicken Mafia when they get hit with catastrophic losses from Salmonella and/or Bird Flu. In Jan. 2010, BF reported that PIERC planned to expand their coverage to Avian Influenza around Mar. 2010. The current situation of this insurance and PIERC is hard to determine. PIERC seems to have been registered as a corporation doing business in most or all provinces across Canada, but appears to have let lapse (ie. surrender) their business registration and/or licensing to offer insurance in Alberta in 2011, Nova Scotia in 2011, and has been refused a license to sell reciprocal insurance in Quebec as of July 2013, and become quite pissed off about that fact. PIERC is off the books and running in stealth mode for the Chicken Mafia, where secrecy is king. So we don't really know for sure, but here is some speculation sprinkled with some assumptions. Each provincial Board has (or will) mandate each CAFO chicken factory farmer to comply with the Board's biosecurity standards (as poor and superficial as those standards may be), and in return have mandatory coverage by the insurance policy issued by PIERC to that Board on behalf of each chicken farmer. Why make it mandatory to have insurance? The Chicken Mafia says it is made mandatory so as to ensure rapid recovery if disaster strikes. In reality, insurers like this mandatory coverage, and insist upon it (just as they did for car insurance in Canada, and US Health insurance under Obamacare) so that profits are maximized, the insured pool is maximized, and risk is allegedly spread over a larger base so that the Law of Large Numbers applies (ie. fewer anomalies). What really happens is that the negligent hide better in a larger forest, escaping easy detection, maximizing Moral Hazard. Farmers pay a higher levy fee to their Board for every chicken or egg raised, to pay the insurance premium to PIERC. That insurance premium becomes a cost of doing business for the farm, and is therefore used to calculate overhead costs that get added to the "reasonable" costs that get charged for farm gate commodity pricing. That higher farm gate price gets marked up at each step along the way as the chicken flows through the Chicken Mafia system towards consumers. In the end, everybody along the supply chain makes a little more profit due to the insurance premium paid on behalf of the farmers, so consumers end up paying many times the cost of the insurance policy cost. When biosecurity disaster strikes, as it has in 2015, the negligent (or unlucky?) farmer submits a claim to CFIA and PIERC and gets fully compensated for their negligence (or very close to full compensation). Insurance, especially insurance that has full compensation (or close thereto), has significant "Moral Hazard", where the guilty will reap the benefits of their negligent acts (ie. less work, saving a few pennies in labour and materials by skipping necessary repairs and improvements, etc. ), and are shielded from the consequences of their negligent acts. PIERC likely purchases re-insurance from other insurance companies. That means when PIERC has a claim (as they do in 2015), other insurance companies have to pay for some of those losses. Those other insurance companies see their expected profits disappear and their costs rise from Bird Flu claims, so they have to boost all of their premiums charged to consumers for car insurance, fire insurance, home insurance, E&O professional insurance, etc.. Again, consumers get dinged for Chicken Mafia negligence. If Chicken Mafia's loses for 2015 are too big in BC and Ontario, PIERC will likely send a bigger premium bill for the following year to all Chicken Mafia Boards all across Canada who are a part of PIERC. So even if one province has an excellent and competent Chicken Board and diligent farmers who have excellent biosecurity protocols, consumers in that province will be forced to pay their "fair share" of the negligent cost of doing business in the offending provinces. If the Bird Flu losses are still not yet paid, the Subscription Agreement signed by each Provincial Board likely says that PIERC can make them to ante-up to cover all of the additional losses. Again, those costs get sent to consumers. There is no winning for consumers in this biohazardous deal. Independent, third party risk management experts should regularly assess the biosecurity standards of each province based on accepted risk management techniques such as HACCP, FMEA, FTA, 8D, 5Y and similar techniques. Independent, third party auditors should regularly assess each farm for compliance to their province's biohazard standard, and assign a RPN (Risk Priority Number) based on maximum probable loss, probability of an incident, severity of the incident, and prior detectability of the precursors of that incident. The premium to be paid by each farmer will be based on a sliding scale for that RPN score, and the farm's actual loss record. The amount of insurance is limited to 66% to 90% of the total cost, with the use of co-insurance, deductibles, and similar techniques so that the negligent farmers get a significant financial penalty for causing or contributing to an incident occurring. The insurance premium is disallowed from consideration as an operating costs used to determine the farm gate price. This ensures there is no indirect feed back mechanism to consumers. If the farmer can lower his insurance premium by biosecurity improvements, he gets to keep all of the savings he deserves. If not, the premium is money out of the farmer's pocket with no compensation from consumers. Until this is done, Bird Flu and other biohazardous incidents will likely continue, and consumers will continue to be raped by any negligence and/or corruption caused by the Chicken Mafia inside Canada's dysfunctional Supply Management system. It is the best of times. It is the worst of times. The point of view for CAFO Chicken Farmers depends on whether you are North, or South, of the Canadian-USA border. Does Canada's Chicken Mafia have any empathy for their US counterparts, or just callous indifference, or perhaps hypocrisy? When Charles Dickens wrote "It is the best of times. It is the worst of times." in A Tale of Two Cities, he was speaking about Paris France and London England during the French Revolution. Today, we are at a similar crisis in chickens on both sides of the US-Canadian border. Both Canada and the USA started with virtually the same systems for chicken, small independent farms run by a family. CAFO chicken farms for meat only began in the 1940's. Both of those systems have spiraled out of control to form two different systems of oppression and tyranny. The main difference in these two dysfunctional systems is the identity of the victim. In the US, the victim is the chicken farmer. In Canada, the victims are the consumers and the small flock farmers. These two dysfunctional systems of chicken meat production use similar technologies (eg. hatcheries, breeds, feed, barns, medicines, etc.). These two national and proximate systems for chicken also share similar types of tyranny, oppression, and abuse inflicted on the weak by the hands of rich, omnipotent corporations and individuals. In the USA around the 1950, 95% of U.S. broiler production was by independent farmers. Just 10 years later, 90 percent of the US industry was under contracts for national or state-wide "integrators". Today in the USA, the Integrators run the show (eg. Pilgrim's, Tyson, Sanderson Farms, Perdue, etc.). In the US, 97% of US chickens raised in 2001 are done under contract farming. Any remaining chickens are raised on farms owned and operated by the processors, or by smaller independents providing chicken to local markets. In Canada, the rich and powerful Local Boards of the Chicken Supply Management System (ie. the Chicken Mafia) who run the show (eg. Chicken Farmers of Ontario, and their counterpart in each of the 10 Provinces). Do the Canadian Chicken Mafia realize how good they have it with the government's gift of monopoly? Are the multi-millionaire Canadian Chicken Farmers aware of the plight of the poor, indebted, and abused US chicken farmers? Do the Canadian CAFO chicken farmers have any empathy for the plight suffered by their US counterparts? The situation for US chicken farmers has gotten so bad, John Oliver, a comedian who does a weekly comedy show Last Week Tonight with John Oliver on news and current affairs has taken up their cause by his satirical look at the bad situation, titled Chickens. The True Cost of Cheap Food Food Inc.
Act 2, Act 3, Act 4, Act 5, Act 6. I sympathize with the plight with the plight of the US chicken farmer. Being an oppressed and victimized small flock farmer in Canada helps you to see and feel for the plight of the US chicken farmer. It appears to me that Big Ag. uses their powers and market might to take advantage of these US farmers, to oppress them for more Big. Ag. corporate profits. So where do Canadian chicken farmers stand on the plight of their American brothers? Does CFO, CFC, or any of the other provincial bodies take a stand, and speak out on behalf of their US peers? I haven't heard a peep out of them on this important issue. I wonder why? If any of you are aware of any Canadian chicken farmer or organization who has directly supported or aided US chicken farmer(s) in either word or deed, please post the details below so we can correct the record. If there are no comments to the contrary, it seems reasonable to assume that none exist until proven otherwise. Mark Twain write about the "silent lie" or lie of omission, and how it ensured the continuation of slavery in the US for almost 100 years. Is that similar silent lie at work by Canadian chicken farmers, against the US chicken farmers? Is it because the Canadian chicken farmers are callously indifferent to the terrible conditions their US counterparts suffer through each day? Perhaps the Canadian farmers are too busy counting their money. Perhaps the Canadian chicken farmers, their trade associations (CFO, CFC and the others) are too busy plotting their next scheme to make even more money off the backs of Canadians. Perhaps some are narcissistic psychopaths who only care about themselves, and enjoy watching the suffering of others. If the Chicken Mafia cannot bother speaking out or supporting their American peers, is their any hope in appealing to their sense of fair play, or empathy for the plight of Canadian consumers or Small Flockers? Any empathy that the Chicken Mafia show towards the US chicken farmers would expose their hypocrisy to the suffering they directly inflict on Canadian consumers and Small Flockers. The Chicken Supply Management System will therefore require changes imposed upon the Chicken Mafia, likely requiring riding rough shod over the dead, cold, rotting corpse of the Canadian Supply Management System.